My table tennis team had a bruising encounter last week. We lost 10-0. I can’t even remember the last time I’ve been in a team which lost 10-0. It was probably in my first ever season in London many, many years ago. In truth, none of the matches were close, apart from the doubles, when we were already losing the tie 9-0. This thrashing was a good reminder that no matter how good you think you’re getting at table tennis, there’s always better players who can make you feel like a beginner. I’m not alone in feeling like this. Many players I have spoken to over the years describe similar feelings. You work hard in training. Your level improves. You get good results against similar ranked players. You feel good about your table tennis skills. You feel confident. Then you face a higher level player who identifies and exploits every weakness in your game and wins the match easily, making you look a bit silly. It’s a humbling experience and makes you doubt your ability to play table tennis. You can take these beatings in one of two ways. You can get down on yourself, tell yourself you’ll never be as good as others at table tennis and lose motivation to play. Over the years I have seen several players move up a division, suffer heavy losses, get despondent and eventually give up playing. They just didn’t think they were good enough to play at a higher level, so gave up. This is one approach, but as you can imagine it’s not an approach I recommend! A better approach is to embrace the challenge. Firstly, accept that when you move up a level and face better players, you’re probably going to have some heavy defeats. This is ok. It’s normal. It’s just a part of any competitive sport. As I remind the players I coach – no matter how good you get, there is always a better player. In the 10-0 defeat, I lost easily to a player ranked 150 in England. This player is likely to lose easily to players ranked top 50 in England. A player ranked 50 in England is likely to get beaten easily by a player ranked top 5 in England. A professional player ranked 100 in the world is likely to get easily beaten by a player ranked top 10 in the world. Imagine how that feels? You’re a professional player, training 20-30 hours per week and by most people’s standards, pretty amazing at table tennis. But you play someone ranked top 10 in the world, get a good beating, and feel pretty inadequate. So we all face this situation, even professional players. There is always a better player, capable of making you look silly (unless you happen to be Ma Long). What really matters is how you respond to the challenge of playing better players. So the first stage is to accept that there will always be someone better. The second stage is to embrace this challenge. You need to learn from your defeats and work out how you can improve to compete with stronger players. I wrote a blog post a couple of years ago ‘Coping with defeats in table tennis’, which I encourage you to read (when you have finished reading this blog post). I won’t repeat the contents of this blog post here. Just have a read in your own time. It does have some good advice. But in short, if you can learn from your defeats, work on weaknesses in training and focus on match tactics, you will raise your level over time. It can take a lot of effort and deliberate practice to improve at table tennis. So significant improvement doesn’t always happen quickly. If you get thrashed by a stronger player, it’s unlikely you will win the next time you play. But you shouldn’t worry too much about that. No one is expecting you to win. Your goal is simply to be more competitive. To win more points. To raise your level. This will give you a lot of encouragement for the future. You may not win the next few times you play either, but if you can get the scoreline closer each time, you know you’re going in the right direction. Over time, you can catch-up and eventually beat a player who once seemed so much better than you. You should take inspiration from Dimitrij Ovtcharov. He’s one of the best players in the world, but has always been outclassed by the top Chinese players Ma Long, Fan Zhendong and Xu Xin. Before the recent German Open, his record against these three players was played 27 matches, lost 26 matches. His record against Ma Long (17-0). His record against Xu Xin (6-1). His record against Fan Zhendong (3-0). 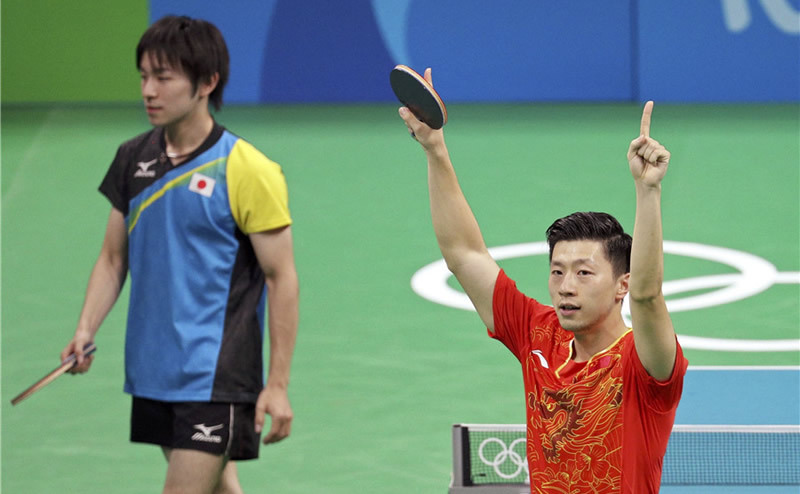 * His only win against Xu Xin was SEVEN years ago. But Ovtcharov has never given up. He has kept working, working, working to be the best he can possible be. And finally last week at the German Open, he did it. He beat Fan Zhendong for the first time, winning 4-3 in the semi-final.